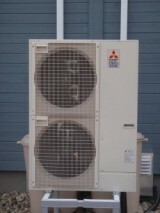 Heat pumps are among the most energy efficient technologies for heating and cooling buildings and providing hot water. 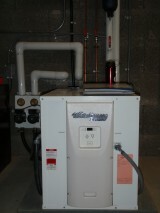 Heat pumps function by moving heat from one place to another. A geothermal heat pump uses ground as the source and sink for heat, while air source heat pumps take heat from the outdoor air and transfer it indoors. Both can be used with a conventional forced air or hydronics system. Since air temperatures fluctuate much more than ground temperatures, air source heat pumps often require a back up source of heat during very cold weather to maintain indoor temperatures at desired levels. This study assesses and compares the performance of a horizontal loop coupled 13.3 kW ground source heat pump and a two stage variable capacity 10.5 kW two stage air source heat pump. The heat pumps are installed in each of two attached LEED™ platinum houses at the Living City Campus at Kortright in Vaughan, Ontario. Results showed that, over the monitoring period, the performance of both heat pumps exceeded manufacturer and EnerGuide ratings, with Coefficients of Performance (COPs) above 5 in the cooling season and above 3 in the heating season. When the energy inputs associated with the heating and cooling distribution systems were accounted for, performance decreased by between 9 and 53%. Modelled optimization scenarios showed that considerable improvements in system efficiencies could be achieved by configuring fans and pumps to operate only when the heat pump compressor is on, and by upgrading the GSHP from a single stage to a two stage system to reduce compressor cycling.